It's what happens when you are sometimes hit by some... virus! You will agree that what you see in these pages is rather useless, not effective, adding not needed weight on an already too heavy bike etc etc. So this is what we bought for the expensive price of 10 euros. 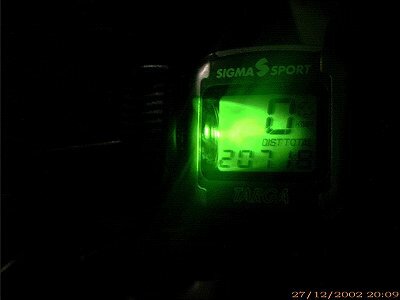 An illumination gadget for lighting up the Sigma Targa odometer at night. Incredibly enough, the thing works as it is intended! Here's proof! So, there! Happy New year!!!! 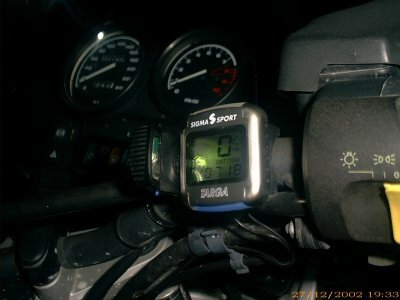 PS: Do NOT forget the little green light on overnight... it will drain its tiny battery!!!! (I did, after the night photo session, and I had to visit my local battery store! ).